InfoSewerH20Map Sewer conceptualizes a sewer collection network as a collection of links connected together at their endpoints, called nodes. The nodes represent manholes, wet-wells, and outlets while the links represent pipes and pumps. The sewer system can be of any topological configuration and can contain multiple loops and outlets. · Manholes represent points in the sanitary sewer system where loads enter into the system. Manholes are normally located at places where pipes connect and where pipe characteristics such as diameter and slope change. · Outlets designate discharge points (e.g., treatment plant, ocean outfall) where flows exit the system and are the most downstream points of the collection system. · Wet wells are structures in the collection system that collect wastewater flows before they are pumped into force mains for transport to another gravity system. · Pipes/Channels are circular/non-circular conduits through which flow is transported either by gravity (i.e., gravity mains) or by the energy supplied from pumps (i.e., force mains). · Pumps are devices that raise the hydraulic head of water through the sanitary sewer system. 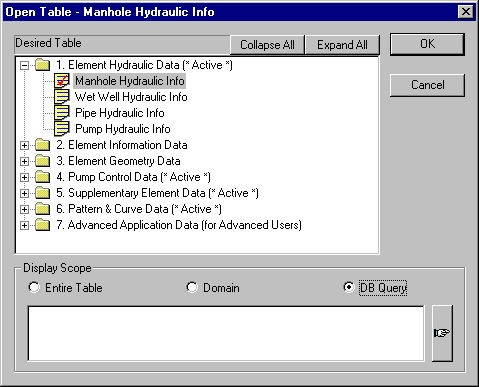 How InfoSewerH20Map Sewer models the hydraulic behavior of each of these physical components is reviewed in the following sections. For the sake of discussion, all wastewater flows are expressed in cubic feet per second (cfs), although the program can also accept flow units in gallons per minute (gpm), million gallons per day (mgd), imperial million gallons per day (imgd), acre-feet per day (afd), cubic meters per hour (cmh), cubic meters per day (cmd), million liters per day (mld), liters per second (lps), or liters per minute (lpm). Wastewater represents the spent or used water from residences, commercial buildings, industrial plants, and institutions, together with minor quantities of ground, storm and surface waters that are not admitted intentionally. 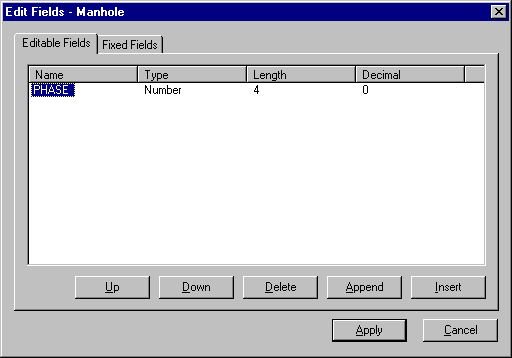 The Database Editor allows the user to open any InfoSewerH20Map Sewer database and edit user input fields (except ID). To access the DBEditor, from the Edit menu, select DB Tables to see the Open Table dialog box below. From the Open Table dialog box, the user is able to see that InfoSewerH20Map Sewer stores database tables in seven separate folders. After selecting the desired table from under the relevant folder, the user has the option of choosing a display scope found on the bottom of the dialog box to open the desired records of the database. Once this is done, click the OK button to open the database table. Once a table has been opened, the user is able to control table operations via the DB Editor icons shown below. Open – Open another database table as shown in the DB Table dialog box. Close – Close the currently selected database table. Close All – Close All open databases. Exit – Exit the DB Editor. View Data – View (including custom format) modeling data tables. Add/Delete Custom Fields – Customize data tables by adding user-defined fields. Click here for more information on adding custom fields. Perform Block Edits – Allows the user to edit table data values, one record at a time or numerous records simultaneously. The Block Editor is a powerful tool when using the used to perform block edits. You can customize InfoSewerH20Map Sewer by adding additional fields to database tables. Custom fields will be available for inclusion on output reports and for inclusion in queries and query sets. Open the Database Editor and click the Open button. From the dialog box, select the desired table from folder 2. Element Information Data. From the Database Editor dialog box, click on the Edit Fields icon to add [Insert, Append], reorder [Up, Down], or remove [Delete] custom fields (see below). The user must know if the desired field to be added will be character or numeric based. Once a field has been added to the selected database, it will be available for editing via the Attribute Browser (under the Information tab). You can also choose to Block Edit the new field with a pre-defined value. The DB Editor provides a means to view all the DB Tables. Any number of DB Tables can be open for inspection, modification and/or data edit. All the data corresponding to the InfoSewer Project may be accessed through these DB Tables. For more information about the different types of data stored in the InfoSewer DB Tables, please refer to the section on DB Tables. Add/Delete/Modify data – Click on any field to change it. The fields that cannot be edited are colored in gray. Once a table has been opened, the following dialog box will appear. Table Record Number – A sequential counter of table records. Used for visual reference only. Save Status – Indicates whether or not a record has been modified. Any records that have been modified will be marked with a red check . To save any modifications, choose the Save button at the top of the table record display. ID – InfoSewer component identifier used for reference by other InfoSewer functions and used for modeling. The contents of this field cannot be edited from the Database Editor. Table Fields – Fields specific to the current table. The field data type (Double), (Num), (Char), etc. is displayed directly below the field name as an indication of the acceptable data format for that field. Field order for fixed fields (those required by InfoSewer) cannot be changed. Field order for custom fields can be changed. Click here for more information on the different InfoSewer Tables. Empty numeric data will display as “0.00” (depending on user-specified decimal precision). Empty character data will display as empty data cells. Selected records (rows), fields (columns), or individual data values (cells) will be highlighted in black. Non-editable fields are displayed in gray. These fields are typically graphical/locational in nature and must be edited using other InfoSewer functions.